Happy birthday Tony Ross (I’m Coming to Get You! ; Wash Your Hands! ). It’s the birth date of Margot Tomes (1917-1991), Homesick: My Own Story, Phoebe the Spy, and Thomas J. Dygard (1931-1996), Infield Hit, Second Stringer. In 1793, the Musée du Louvre opens in Paris, France. Read Louvre Up Close by Claire d’Harcourt. Happy birthday Missouri, admitted as the 24th U.S. state in 1821. Read Missouri Boy by Leland Myrick. The Civil Liberties Act of 1988 was signed by President Ronald Reagan on this day, providing reparation payments to Japanese Americans who were interned by the United States during World War II. Read A Place Where Sunflowers Grow by Amy Lee-Tai, illustrated by Felicia Hoshino and Baseball Saved Us by Ken Mochizuki, illustrated by Dom Lee. Around this time of year families and children start wrapping up summer activities and begin to prepare for a new school year. All those summer camps, weeklong or month-long, come to an end. In 2011 Helen Frost published Hidden, a novel that will make me look at those summer camps in a slightly different way. When I picked up Hidden, I had only a few minutes, and lots of deadlines. I was merely going to scan a chapter to get a sense of the book. Do not make this mistake with Hidden! Unable to do anything else until I found out how the story ends, I finally put the book down several hours later after I had missed a deadline or two. I’ve had reports of other readers, adults and children ages eleven through fourteen, who have had the same experience. 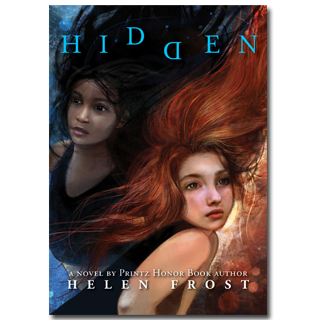 In Hidden, Helen Frost works in free-verse format to relate the story of Wren Abbott. In first person, Wren tells us how as a happy eight-year-old girl in a pink dress she waits for her mother in the family minivan. But in one of those terrible twists of fate, a bank robber seizes the van for a getaway and drives the car to his home. Wren finds herself alone, in a dangerous position, and must use her wits to survive. She is aided, in part, by the man’s daughter Darra, who brings food to the girl now held captive in their garage. Wren escapes and unintentionally helps the police locate the criminal. Darra’s world is now turned upside down; she doesn’t understand what happened that day and wonders who is to blame for her father’s incarceration. Her parents? Herself? Or Wren? When they are fourteen, Wren and Darra end up at the same month-long summer camp in Michigan’s Upper Peninsula. What should have been a wonderful camping experience for Wren becomes a nightmare. Suddenly she must relive the events from six years earlier and come to terms with her past. Darra must face her own guilt and anger, her feelings about her father who is now divorced from her mother, and her unanswered questions about the events of that fateful day. Told in alternating sections by Darra and Wren, the book moves to a completely credible but breathtaking finish. Showing how childhood trauma can shape character and give strength, the story presents two totally believable and likable young girls, struggling to make sense of their past. For my taste, Helen Frost has emerged as our greatest living craftsperson of verse novels. Hidden maintains her reputation in that arena. In the end she shows readers how they can revisit the verse and find other details hidden there. After reading the book in one gulp, both adults and children will want to go back to this complex book and learn more about the characters. Thank you Helen Frost. In novels such as Diamond Willow, Crossing Stones, and Hidden, you have crafted books that treat young readers with respect. Hidden is another Frost gem—don’t miss it! no one notices me much). At least someone here knows my name. in the mirror, but she doesn’t glance down. Is she going to pretend she didn’t write it? Originally posted August 10, 2011. Updated for . Hidden looks amazing. Anita, have you read Hotel on the Corner of Bitter and Sweet? Until this book, I was ignorant to the Japanese Americans interred in Seattle. Fascinating, horrifying, and endearing in one wonderful book. Sarah and Bookjeannie: Thanks for the suggestions for the sidebar. Hidden is a remarkable book! It will be useful to teachers and counselors to open discussions about parents who have been jailed, among other things. And the camp part: spot on! To add to this the great read, and the amazing poetry is a remarkable feat. Helen Frost is such a gifted writer! I am finding that middle school readers are loving books in free verse. I cannot wait to read Hidden. It is already on my wishlist on Amazon. I love reading your blog daily. A mutual friend, MrShuReads, turned me on to your blog. This is a most amazing book as are her others. She writes the most intracate verse I’ve ever read and the way she hides other poems within her poems is outstanding. I gulped this down then went back to reread it for the hidden poems. The next thing I did was hand it to my 16 year old who has been writing poetry since she learned to write who promptly devoured it even though she is an avowed hater of novels in verse. Next the book was handed to her English teacher–all within 24 hours. Needless to say I always look forward to her newest book. Julie: I just saw a cover image for Salt, Helen Frost’s next book. Like you I am always eager to see what she will write next. This is an amazing novel in verse. I have read it several times for different purposes and have enjoyed it every time. Frost is so technically creative in this novel in verse as she creates a sideline story within the story. It is definitely worth reading. Great novel for those reluctant teen readers! I read Helen Frost’s “Salt” and became a devoted fan instantly. “Salt” is so well researched and lovingly crafted. I will definitely give “Hidden” a look.